Have you been struggling to find a good affordable property in Bangalore ? Are you ready to treat yourself with the best solutions? Please find a table by the end of this article, summarizing the benefits of the same locations. Driven by the IT industry, India's Silicon Valley, Bangalore, has become the most lucrative property market in the country. Every year it witnesses a large influx of migrant community in search of better job opportunities. From affordable to mid-segment to luxury housing options, the city has something to offer under every price bracket. The bracket however remains the most popular amongst the homebuyers in Bangalore continues to be the mid-segment range starting from Rs 40 lakhs and going up to Rs 60 lakhs. There are several locations in the city, which offer ready homes, another prime criterion of homebuyers these days, priced within Rs 50 lakhs. Several such locations, including Gottigere, KR Puram and Hormavu Agaria have reportedly witnessed an upswing in the capital asks to the tune of four percent. 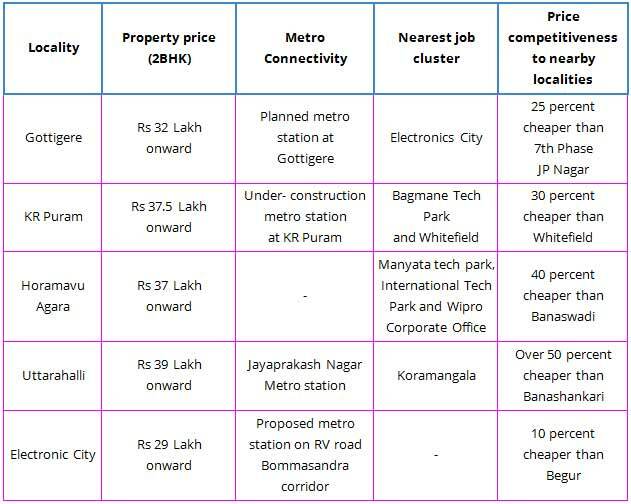 Lets look into the factors leading to such a demand for Bangalore properties in these locations. A location situated the Bannerghatta Road in the Southern part of Bangalore, emerged as a frontrunner, clocking four percent growth in the capital asks in Oct-Dec 2018 vis-a-vis July-Sept 2018. Surrounded by 7th Phase JP Nagar, the locality is known for offering a range of affordable and mid- range housing options at an average price of Rs 4600 per sqft within Rs 50 Lakh, a homebuyer can opt for a 2/3BHK apartment measuring 900 sqt ft. Some of the major key growth drivers include, Robust physical and social infrastructure including Silicon Valley School, Vijayashree Hospital and Royal Meenakshi connectivity and proximity to employment hubs (Electronics City and Koramangala). There is an upsurge in the capital and improvements in the growth prospects of the region due to an upcoming metro corridor between Gottigere and Nagarwara. As far as developers are concerned some of the prominent developers including Brigade and K raheja Group have their presence in the locality. Moving on to KR Puram .. This location is literally in the middle, rather in the heart of the city. It is one of the most renowned and desired of the locations in the city. After being hit by the IT boom in the 1990, this side of Bangalore has gone through a massive transformation in terms of social infrastructure and growth. These contribute majorly to the connectivity quotient of the region. The location homes several government offices and attracts several mid-segment buyers because of the sufficient affordable and mid-segment inventory. If you're planning to buy a 2 BHK unit measuring 950 sqt in the locality, it will cost you Rs 35 Lakhs onward while a 3 BHK apartment of 1250 sqft area costs Rs 42 Lakhs onwards. This location is in the close proximity to Banaswadi, Ramamurthy Nagar and KR Puram. The capital values in the locality surged by three percent quarterly. According to the Managing Partner of Network Ventures, Kareem KHAN, "Horamavu has a strong demand from the working professional crowd because of its proximity to the nearby industrial centres, IT hubs and tech parks. This location also homes a number of mid-segment housing options to choose from at a competitive price." Above mentioned are some of the renowned social amenities present within the neighbourhood of Horamavu Agara. The locality also offers an easy access to MG Road and the rest of Outer Ring Road through a well connected road network. Talking about homes, if you are searching for a 2 BHK unit measuring 900 sq.ft. it will cost you Rs 35 lakhs and for a 3 BHK measuring 1200 sq.ft. it will cost you Rs 47 lakhs onwards. This location saw an increment of 2 percent in the capital quarterly, due to its location advantages and affordable properties. The locality is renowned as one of the fastest growing areas in the suburb of Bangalore city, while it has been witnessing rapid commercial and residential developments. The city houses amazing civic amenities such as hospitals, schools banks and markets, namely, Bangalore International School and Brightway school, sri sai ram Hospital, Spar Hypermarket and State Bank of India. These are some of the social amenities present within the neighbourhood. If you're looking to invest in a 2 BHK measuring 1100 sq.ft. in this locality it’ll cost you around Rs. 39 Lakhs. This locality has some incredible benefits from the fact that it is surrounded by premium localities such as the JP Nagar and Banashankari, that prompts homebuyers to look for affordable options here rather than spending more in those localities. Talking about connectivity, this location has a strong metro connectivity through Jayaprakash Nagar metro has not only strengthened the connectivity but has also spiked the property values in the region. Average property values in Uttarahalli comes around Rs.3600 per sq.ft. as of 2019 insights. Coming to the last location in the list.. The city lives up to its name; it is one of the biggest IT hubs of India. This location also saw an increase in capital value of 2 percent, quarterly. There has been a rapid IT and commercial expansion since it was hit by the IT boom in 1990s. This region of Bangalore boasts of its social infrastructure being well developed and maintained, includes the following..
and local markets that cater to the daily needs of the residents. Road ways to Bangalore city centre, proximity to other prominent areas like the HSR Layout, Bilekahalli, Bommanahalli and Sarjapur Outer Ring Road is one of the major growth driving factors of this locality. The upcoming projects like the metro station will further enhances the connectivity feature of the area, giving a boost to the property market of this locality. If you're looking for a property to invest a 2 BHK unit measuring 1000sqft in this locality will cost you within Rs 50 Lakh. The rapid growth and development of infrastructure and IT sector expansion in Bangalore has a potential of major rise in the property prices in these localities. The demand from professionals and migrant communities are expected to further rise the real estate growth, they are directly proportionate to each other. These locations while they are affordable also attract more developers and investors in future.